The Rococo Outdoor Chair will be perfectly at home in your Mexican office, Mexico patio or pool area or in your Mexican dining room. The Rococo Outdoor Chair will be perfectly at home in your Mexican office, Mexico patio or in your Mexican dining room. Made of polymer resin (read: forever durable) in a variety of colors. 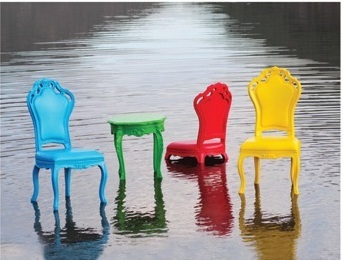 Add these uber cool chairs to your patio or outdoor entertaining spaces and your parties will never be the same again ! Shhh ... they say you can even throw these in the pool! Price and dimensions given are for one chair. Side table dimensions: 24" long x 24" deep x 25" high.